I used to read the X men comic books when i was a kid. I even made wings out of card board and somehow attached them to my back. I daydreamed i was Angel. I would run around with my wings outside...I wish i was a kid again. 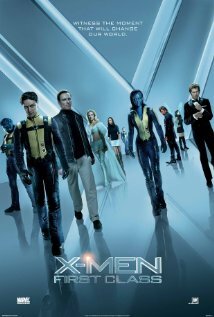 X men first class was the best of the X men movies. It is that good! The characters's backgrounds are very fun...You should see it. Fun. We ate at Blue Fish restaurant for sushi. Super good! I love Sushi. And i love fish eggs...It is a delicacy in France. We eat them at Christmas on toasts. I always ask for extra eggs on my sushi. My 16-year son sat me down to watch X men on Netflix just last night and it was great. I think he was setting me up to take him to this movie. Thanks for the review. I LOVE X-Men, I made a mask when I was a kid I pretending i was Shadow Kat :) brings back good memories! Mmmmmm caviar!!!!! great on egg salad on toast points. yummy! Read comix, did not get into X-men. I preferred Batman then. :) Something about rugged guys in long, flowing capes run around catching bad guys, I suppose. Hey--if you have a little time, want to help solve a French language mystery over at the Studio? If not, maybe next time. Hope all is settling finally and your new home is pleasing, no matter how small it may seem.